AP(R) teachers know the roots of AP(R) success are established in the earlier grades. That is the idea behind Foundations of Language & Literature, a complete program for 9th Grade Pre-AP(R) that establishes foundational skills, while challenging bright young minds. The book is driven by the expertise of Renée Shea, John Golden, and Tracy Scholz who know that skills like reading, writing, and working with sources need careful development and constant reinforcement. This genre and mode-based book approaches the course in new ways, investigating nonfiction as well as literature, delving into fascinating argument-driven thematic units, and asking students to write in the genres, to empower them to read like a writer. Innovative, challenging, and nurturing, Foundations of Language & Literature has all the support young minds need to be prepared for AP(R) success. 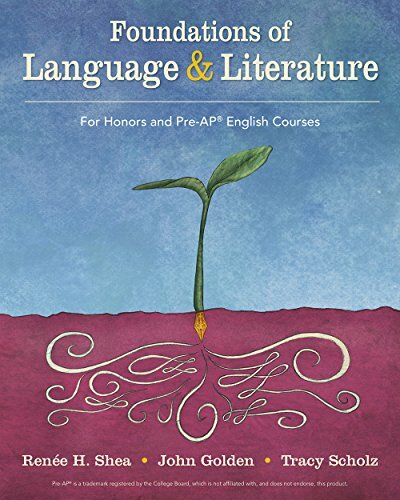 With the publication of Foundations of Language and Literature, BFW now offers a unified program of Pre-AP(R) and AP(R) English textbooks from grades 9 through 12, that guides students from introduction to mastery with a consistent tone and treatment of key AP(R) topics.